Imagine a garden full of brightly colored flowers, oranges, yellows and blues. Your children are squealing as they find yet another caterpillar hidden on a plant. Then their attention is diverted as they spot a yellow butterfly fluttering nearby. 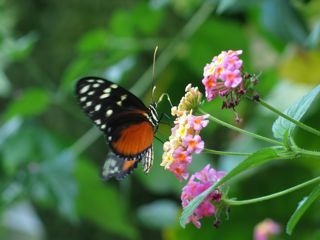 As they race to get a closer look, a bright orange and black butterfly glides into view. Everyone points and cheers as they spot the first monarch of the year. Seem like an impossible dream? Actually with a little research and a small plot of ground, almost anything is possible when it comes to butterfly gardening. Plant a few food plants and some well-chosen flowers, and your garden can become an outdoor paradise for learning about butterflies and other insects. What do you need to do to start a butterfly garden? The first step is research, research, research. Every region has its own unique blend of plant and butterfly species, and what works in one place may not in another. You and your children will need to look for species of butterflies that occur locally, and then find out what plants the adults use for food (nectar usually), and plants the caterpillars feed on. Fortunately in most areas there are individuals and organizations that are interested in butterfly gardening, and they have probably done some of the research for you. 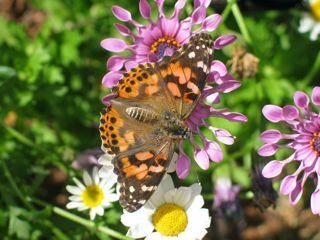 Try an Internet search for butterfly gardening in your region. Visit your local botanical gardens or arboreta. Look for regional books on butterflies and butterfly gardening. Also, keep records of what kinds of butterflies you see when you are hiking or walking through your neighborhood. Try to figure out what plants they seem to prefer. 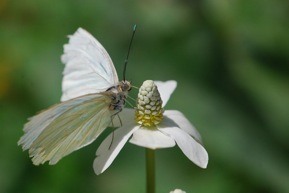 Scientists have shown adult butterflies prefer flowers that are yellow or blue. 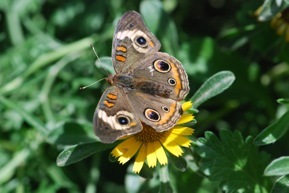 They also prefer flowers that are flat, so they have a platform to stand on while feeding, like this buckeye butterfly. Neat fact: Ever look closely at a Lantana flower? The center is often yellow and the outside dark pink. The yellow flowers are the fresh ones, with plenty of nectar and pollen. Once each individual flower in the cluster has been pollinated, it turns dark pink and is no longer attractive to butterflies. 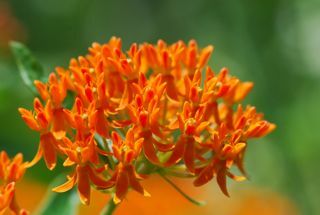 Butterfly weed is a common plant that will attract many butterflies. The adult butterflies lay their eggs on the plants their caterpillars will eat. 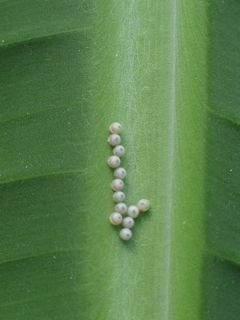 (These are the eggs of a large moth, by the way). The caterpillars or larvae feed on the plant once they hatch from their eggs. Some caterpillars feed only on one or a few plants. For example, fritillary caterpillars feed on passion vines. 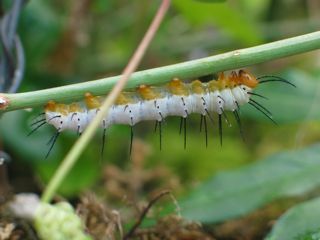 Other caterpillars may use a number of different plants as food. Also, some species may use one group of plants in one region and a different set in another region, depending on temperature, plant availability, etc. You only need to provide one or a few of the correct plants to attract butterflies. Adult butterflies may be attracted to feeders, or pieces of certain kinds of fruit. There are some simple butterfly feeders that are easy to make. 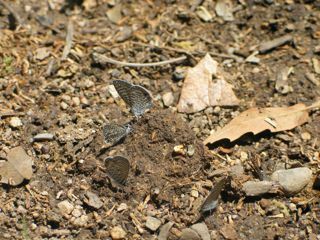 Adult butterflies may also be attracted to patches of mud, particularly the males. This behavior is called puddling. After you and your children have decided which plants will work for your area, decide where to plant them. If you have a large enough space, you might want to develop a formal design. If not, plant them where you can. Just take care that if the plant requires sun, that it is a place with adequate sun and vice versa with shade-loving plants. If possible, include your children in the planning and planting of the garden. Giving them ownership of a project is great for children’s self-esteem and helps maintain their enthusiasm. If things don’t go as planned, celebrate the mistakes as learning opportunities. Once the plants are in, the ideas for projects will begin to flow. Planting a butterfly garden with children is sure to take you into directions you never dreamed possible. Here are some books about butterflies and caterpillars in a later post. There are also some books listed in the white-lined sphinx moth post.